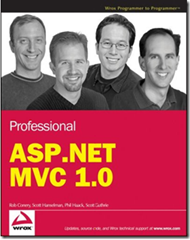 In ScottGu's (Scott Guthrie) latest blog post he states that the MVC framework for ASP.NET is about to ship any day now. He also mentions that a book will be available soon, it's written by Scott Guthrie, Scott Hanselman, Rob Conery and Phil Haack. Check out their blogs for some interesting reads. Have been testing MVC for a while now and its so much nicer then dealing with webforms ... It will be interesting to see if anyone can get EPiServer working with MVC *fingers crossed*.